Newport, Rhode Island 1903. 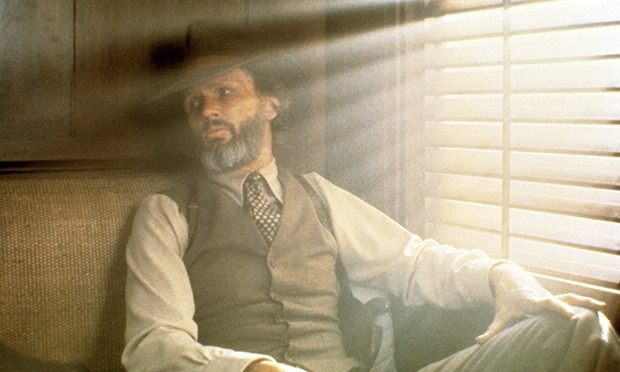 The epilogue to Michael Cimino’s revisionist Western, Heaven’s Gate is an enigmatic affair set aboard an opulent yacht. You can practically taste the melancholy of the Gilded Age in Vlimos Zsigmond’s breath-taking cinematography. The ageing James Averill, once Marshal of Johnson County is now dressed like a retired Commodore, clothing befitting the home of the United States Naval War College and his privileged birth right. Yet Averill is a well-dressed ghost of his former self, soulless as he gazes from the deck. Could Averill be sailing to a New World Avalon for his own Last Sleep with the ruling class he so despises? Below deck Averill’s old Harvard girlfriend lies in glittering silver, a beautiful sloth immobile and useless. Dutifully Averill lights her cigarette, just as every well-bred gentleman should. Regret and sorrow mark his face. This woman is no match for his beloved Ella Watson, a bordello madam who so beguiled him back in Wyoming. Visibly upset he walks back on deck perhaps to contemplate those lofty ideals set out in his graduation speech by The Reverend Doctor, “The contact of the cultivated mind with the uncultivated,” the “education of a nation.” Perhaps Averill took those ideals at face value believing in them to improve the lot of all men rather than expanding the greed of the wealthy few? Undoubtedly Cimino saw something of himself in Averill, a man destined to bring high culture to the masses, his own fall from grace well documented in Stephen Bach’s book Final Cut: Dreams and Disaster in the Making of Heaven’s Gate. Effectively banished from Hollywood after his initial $11 million budget spiralled out of control into one of $44 million, Heaven’s Gate destroyed both United Artists and the brief love affair with auteur, adult driven cinema of the 1970s. Bach, then vice-president and head of world production for United Artists crumbled when faced with removing the wayward genius of Cimino, caving into the director’s pedantic (and very expensive) demands. Cimino certainly believed the hype lavished upon him after winning both Best Director and Best Feature Oscars for The Deer Hunter in 1978. For Heaven’s Gate he shot over 220 hours of footage and printed it all at huge cost in the pursuit of artistic excellence. Sets were built, torn down and rebuilt; an irrigation system was installed so the blood of the climatic battle would be beautifully contrasted with the lush green vegetation. Cimino slaved day and night over his Magnus opus, convinced of its perfection. John Powers of LA Weekly took a different view, “With money in hand Cimino went artsy-bananas and donned his Napoleon hat for the slow, slow, slow march to masterpiece Moscow." “Artsy-bananas” or not Cimino’s extravagance embellished or otherwise, can only contribute to the mystique that surrounds Heaven’s Gate. Much like Napoleon’s catastrophic retreat through Russia in 1812 it is almost impossible to divorce the myth from reality. Cimino’s supposed talent like Napoleon has divided opinion, according to David Thomson Heaven’s Gate is, “A wounded monster” a film to be watched at arms length to see if the old beast still retains any claws. Should the audience leave it to bleed slowly to death alone and out of harm's reach, or remember it as the fearsome predator that once sacred Hollywood to death? Heaven’s Gate is a highly fictional account of the Johnson County War, a dispute between wealthy land barons and European immigrants in Wyoming in the 1890s. Cimino’s epic opens with lengthy scenes of Averill and his best friend Billy Irvine’s graduation from Harvard in 1870. The sequence is a grandiose spectacle featuring dozens of couples waltzing to the Blue Danube. The choreography is as dazzling as it is dizzying and we are lost in its grandeur, swept up in the pomp and circumstance of America’s elite. Surely we can forgive Averill’s naivety in believing the philanthropic zeal of The Reverend Doctor and his ilk? We rush forward twenty years as Marshal Averill returns to Casper Wyoming on his way to Johnson County. For many, Heaven’s Gate should have started this way, the classic Western opening, and the lone gunman arriving in a hostile town. The street scenes beggar belief, their realism rivalling Barry Lyndon’s acute attention to period detail. However, compared to Kubrick’s restraint these scenes teeter dangerously on the brink of hubris as the hundreds of extras, horses and carriages drown out much of the dialogue. That being said in this age of CGI the sense of time and place achieved by Cimino is staggering, overwhelming. At a board meeting of the Wyoming Stock Growers Association, Frank Canton reveals plans to kill 125 settlers who have been convicted or suspected of cattle rustling. These are Averill’s peers including the now alcoholic Irvine who later remarks to a horrified Averill, “In principle anything can be done.” This is the betrayal of the American Dream by the very men who should uphold its ideals. Canton’s gentleman’s club resembles the civilized barbarity of the Wannsee Conference, chaired by Reinhard Heydrich in 1942 at which the Final Solution was revealed. The largely Eastern European settlers we see hauling carts along dirt tracks could be fleeing the Nazi Einsatzgruppen as much as the Association mercenaries Remington rifles.